De afgelopen dagen heeft de Tweede Kamer gedebatteerd over een nieuwe wet op financiering van politieke partijen. Opmerkelijk genoeg is de discussie apart gevoerd van de discussie over de Geefwet, die intussen is aangenomen en per 1 januari is ingevoerd. In de zin van de Geefwet zijn politieke partijen Algemeen Nut Beogende Instellingen. Maar zijn politieke partijen ‘goede doelen’? Maar over deze vragen gaat het niet. Toch nog maar eens even teruggekeken in onze cijfers uit Geven in Nederland 2009: wat geeft de achterban van politieke partijen eigenlijk? A new ‘Law on Giving’ has taken effect in the Netherlands on January 1, 2012. The new law includes a unique ‘multiplier’ for donations to culture and the arts. The multiplier increases the level of deduction for donations to organisations officially registered as charitable causes in the sector of arts and culture. It is expected that donations to arts and culture will increase as a result of the new law. Read more about the context of the law in this blogpost. How trusting is the Dutch population? Statistics Netherlands recently published a table showing that generalized trust is increasing among the Dutch Population since 2002. It is said that 67% now ‘trusts fellow citizens’. This trend does not emerge from the data TNS/NIPO collects for the Giving in the Netherlands Panel Survey of the Center on Philanthropy at VU University Amsterdam. To be more precise, agreement with a statement reflecting trust (“In general, most people can be trusted”) on a 1‐5 scale shows little change. But disagreement with a statement reflecting distrust (“You cannot be too careful in dealing with other people”) shows a clear decline. The decline is fairly substantial: in 2002 36.8% of the population disagreed with the statement, but in 2010 only 22.8% disagreed. 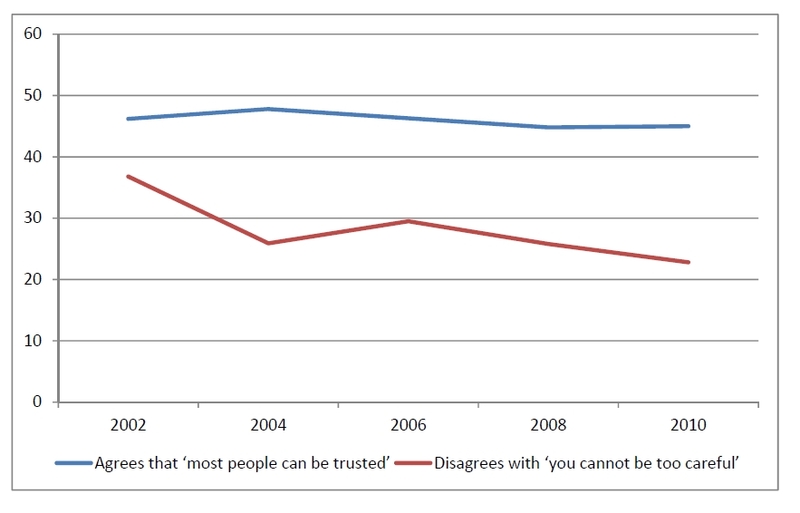 Counting respondents who show more trust than distrust as ‘trusting’ respondents, the trend is clearly negative. running from 0 ‘you cannot be too careful’ to 10 ‘most people can be trusted’. The 67% is the proportion of the population that scores above 6. Ignoring potential differences in sampling frames and response bias, it is clear that “Methodology is Destiny”. Download this post (in pdf).